The field is tougher than at the 2010 World Cup in South Africa. 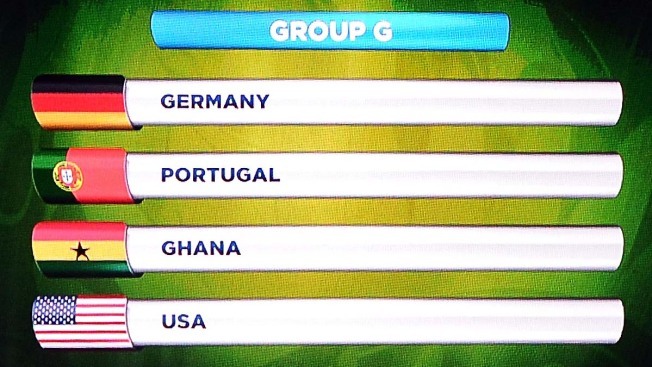 The United States will play Ghana, Portugal and Germany in a tough first-round group at next year's World Cup. Making their seventh straight appearance at soccer's showcase, the Americans were drawn into Group G and will open on June 16 in Natal against Ghana, which eliminated the Americans from the last two World Cups. With the longest travel schedule of any World Cup team at almost 9,000 miles, the U.S. meets Portugal and Cristian Ronaldo on June 22 in the Amazon rain forest city Manaus. The Americans close group play on June 26 in Recife against Germany, which beat the U.S. in the 2002 quarterfinal.